Besides exercising, there are certain foods (and drinks) that can increase metabolism and accelerate fat loss. If you are already following a workout program and nutritional plan, these metabolism boosters can give you an edge and enhance your fat burning results. Studies have shown that green tea has thermogenic properties. It increases energy expenditure (metabolism) and fat oxidation. The weight loss effect is due to the combination of catehin polyphenols and caffeine in green tea. Capsaicin, the compound which causes heat in hot peppers, can increase metabolism. As it enhances thermogenesis, more calories are burned. Capsaicin also reduces appetite so you eat less. Not many people can tolerate the burn of hot chilli peppers on their mouth. It is also difficult to get enough capsaicin from diet to benefit from its fat burning effect. Fortunately, you can find capsaicin in capsule form, that is easy and convenient to take as a supplement. Protein has the highest thermic effect of all macronutrients. It increases metabolism as it takes more energy (and time) to digest protein than carbs or fat. Protein requires 30% of its calories for digestion and processing. So for every 100 calories of protein that you eat, your body burns 30 calories just for digesting it. Hence, the net calorie intake is only 70 calories. Protein increases satiety and doesn’t cause insulin spikes like carbs. This macronutrient is also essential for building muscle and preventing muscle loss in our bodies. Lean muscle increases the resting metabolic rate so you burn calories even at rest! The best source of protein is from lean meat. If you are not a meat eater or for ease of convenience, consider supplementing with a high quality, protein powder. 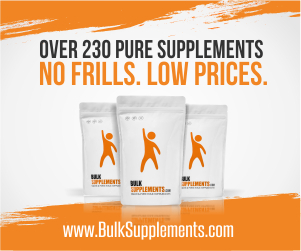 Bulk Supplements offer grass fed whey protein powder and pea protein powder that contain no filler and additive, at unbeatable prices. Besides drinking it as a shake, protein powder can be added to pancake, oatmeal, smoothies and yogurt.